XS CHILD Size Little GIRLS size 4 Polyester top and ruffle Soft elastic in neckline and sleeves Has Flame resistance with washing instructions to retain it. APPROXIMATE MEASUREMENTS: Shoulder to shoulder in back =about 10" underarm to bottom = 20" Chest at underarm = 12" NEW WITH TAGS Shiny Blue Polyester top and ruffle with soft, stretch knit body Please note: The white tag is for photo identification. 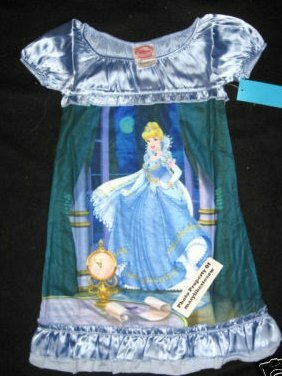 It is not in the nightgown. I will combine shipping with any of my fleece blankets and fabrics. Please view my fleece baby and toddler blankets.